Any artist, in the process of creating art, is also a student and scholar of art, history and philosophy. An artist who takes this multiplicity of roles seriously might be called an “arteologist.” In this process, the arteologist is like an egregor or a griot, helping to ferment and mature the connections that in contemporary art are linked to cultural identity, historical meaning and spiritual transformation. I am an immigrant from Puerto Rico to the United States who has lived in Paris and other parts of the post-industrial metropolises of the Western and developing industrial metropolises of the Eastern world. The various stages of globalization I have encountered through these migrations have reconfigured my artistic language. It has become a language that speaks of fragmentation and the displacement of the emigrant, about a multicultural diaspora that is re-lived daily by millions of exiles, refugees and migrant workers, constantly mutating, multipolar individuals. My work examines trans-Caribbean and transnational history in order to help locate and rebuild bridges to our past that can anchor us in our collective future. This process has demonstrated to me the need for a new mythology for the 21st century. I hope my work suggests some possible outlines for that new mythology. I want to speak here of globalization, as the deployment of a system of production of symbols and material goods. The powers of symbolic production, religious, artistic, political and intellectual, continue to be subjected and integrated into the economic apparatus according to its own industrial and commercial criteria. One key way this interaction takes place is via the new media, which is predominately used for economic power. However, new media lets other voices co-create and transmit experiences to an audience beyond the physical space inhabited. The resulting cross-cultural fertilization afforded to those of us who function as arteologist allows us to not only create and deploy symbols of meaning, creativity, and imagination, but also challenges exclusions to the current dominate production of knowledge and reality. To spell this out, I will show you some installations from exhibitions in Puerto Rico, New York, the Dominican Republic, and South Bend, Indiana in which I integrate artifacts, ancient manuscripts, assemblages of found objects, encaustic paintings and sculptures with poetry and new media. The intent is to reconfigure history. 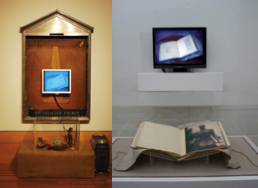 Keeper of History – Holder of Dreams, 2006 presented at the National Catholic Museum of Art and History in New York City. 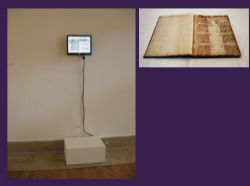 A screen displaying a video that is continuously showing on a website is incorporated into both exhibitions. The video depicts pages of a book also entitled “Keeper of History Holder of Dreams” which I co-created with poet mboncher. 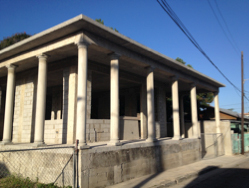 The turning of the pages of the book tells the story of an Espiritismo-faithed family’s construction of a casa (house), a metaphor for the political and economic reconfiguration of the Country of Puerto Rico from the 1950’s to the turn of the century. 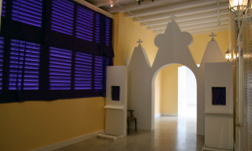 The concurrent exhibitions linked, in particular through this new media component, connects the Puerto Rican story, the diaspora, and ongoing interrelationship between the people who live on these two Islands. The 5-second projection of each sequential page of this hand made book also alludes to the loss of the tradition of oral history, the death of the tradition of the book, and the emergence of ephemeral method of dissemination of information. 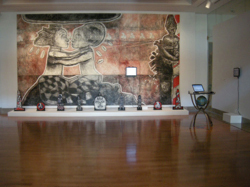 Free Registry: Encounter, Mythology and Reality, 2008 was presented at the Museo de Arte de Puerto Rico in Santurce. This installation hinges on a large encaustic painting that responds to the 1852 Slave Registry from Ponce. The painting is of Damballa, the female and male deities of fertility of Loas. 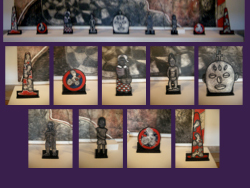 The installation also includes nine wooden sculptures of African figurines placed on a long, low floor stand underneath and in front of the painting. 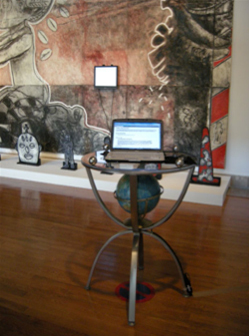 An assemblage consisting of a metal table with a globe provides a platform for a working keyboard that is connected to a screen embedded in the painting. Another screen mounted on the wall near the assemblage display pages of the Slave Registry from the Village of Ponce, a 1852 lists of the slaves of Ponce organized under the names of their owners and described using physical characteristics as if they were third person objects. The audience, both those who use the keyboard at the exhibition and those who go online from elsewhere to the Web page blog called “Free Registry”, are invited to write their responses to the “Registry of Slaves”. The “Free Registry” enables the audience to tell their stories, their family’s stories, are-conceptualized history, in the first person. These stories become part of the exhibition through the screen embedded in the painting, which displays them and more broadly through the blog. 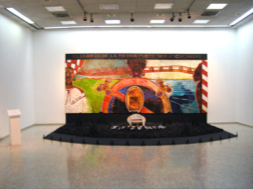 The Crying of the Earth is a large altar that I created for the 1st Caribbean International Triennial at the Museo de Arte Moderno in Santo Domingo, Dominican Republic in 2010. Although the piece does not use new technology, I decided to include it in this presentation as the story it tells is truly of cross-culture and global import. The installation includes a large encaustic painting responding to the oil spill from the British Petroleum Deepwater Horizon Oil Rig in the Gulf of Mexico in 2010. The sign at the top of the painting says in Spanish EL LAMENTO DE LA TIERRA PUEDE SER ESCUCHADO (THE CRYING OF THE EARTH CAN BE HEARD). On a pedestal located to the right of the painting is a poem with the same title written by poet mboncher. In addition to the painting, the installation includes floor space covered with charcoal, an assemblage of wood and metal suggestive of a trap and flat wooden letters painted gray spell out the message SE VENDE (FOR SALE). 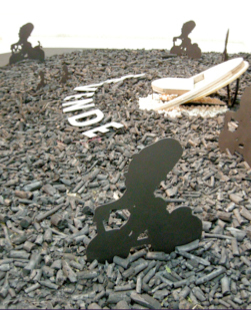 Small figurines painted black represent Afro-Caribbean characters on bikes who emerge from the charcoal like an army of young men and women who confront the crisis of global warming. Ecological disaster not only affect the country creating the problem but for the whole world. 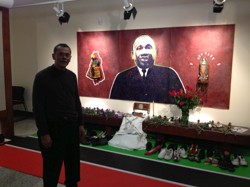 I presented the Altar of Freedom: Opening Paths in All Directions at Notre Dame University in 2013, as part of a commemoration of Dr. Martin Luther King’s visit there 50 years before. This interactive and generative installation includes a portrait of Dr. King painted on paper, symbolic objects like the cast of Elegüa and La Madama doll representing the African Heritage and a statue of Our Lady of Guadalupe representing the Mexican Day of the Dead (El Día de los Muertos). The installation was designed as a chapel for reflection. Note the pew is incorporated into the installation. Donations of shoes and boots from the community allude to the leaders, workers, students, who marched and continue to walk and work for civil rights in the US and internationally. 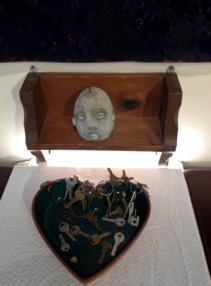 Participants in the exhibition, as asked on the invitation, brought keys, held in a ceramic heart shaped vase just below Elegüa, the Yoruba deity, who is seen as the “Keeper of the Ways”, the opener of doors, new ways of being. The new components of the exhibition are two fold. 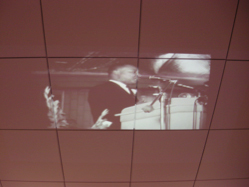 There is a video of Dr. King’s speech in South Bend projected on the ceiling in front of the altar installation, suggestive of what we aspire too. It is best viewed from the pew. 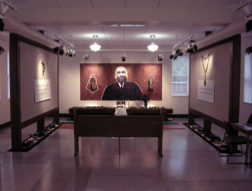 As with Free Registry, the installation incorporates an interactive blog for both those who view the exhibition on site and those who participate via Internet to write about their own experiences in the movement for civil rights. 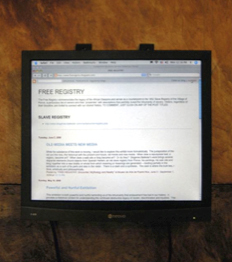 For this installation, the computer and screen are located on the right side of the installation where on-site participants can quietly sit, write and read. 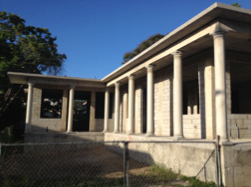 La Playa de Ponce House of Art & Culture is a project my wife and I have undertaken to provide both space for us to live and work in Puerto Rico and space for artists and cultural workers to work-in-residence. The goal, pertinent for this discussion, is to provide not only education for youth who will interact with the artists and cultural workers but also to create connection and empowerment to this community. La Playa de Ponce was once the most vital port in Puerto Rico, connecting the south of Puerto Rico to the Caribbean, Latin America and the world beyond. It has been displaced by the United States control of commerce which now must flow north. Bringing national and international artists and cultural workers to La Playa de Ponce is another method of cross-fertilization in our globalized world.